My, how times have changed – and these lovely 3 photo invitations are the perfect way to show how much the birthday man or woman has changed throughout the years! 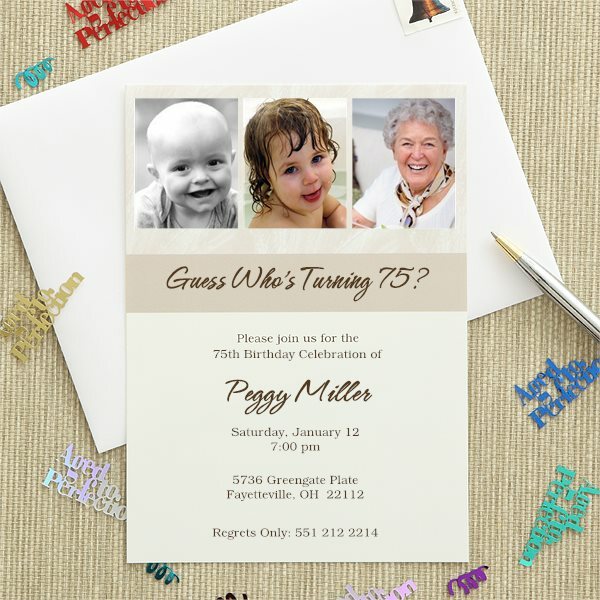 Just upload 3 of your favorite photos, add all the relevant party details (age, date, time and location of the celebration) – and you’ve created lovely invitations that give a peek at the past and the present. The easy-to-use design tool takes just moments to use. You’ll have a chance to preview your invitations before you order them. 5″ x 7″ cards are printed on top-quality 110 lb card stock and include matching envelopes. You can choose to have the return address printed on the envelopes if you’d like. Sold in set of 24; matching thank-you cards are also available.